And that’s absolutely true, for this is not a wholly wooded forest, but a Forest in the medieval sense, a Royal Forest once set aside and used for hunting by successive monarchs and their followers. Ownership by the Crown, jealously guarded common rights, and the presence of extensive areas of acidic, relatively infertile soil have all discouraged agricultural and other developments, leaving intact a remarkably historic landscape. Islands of more fertile ground can, however, be found, and it is around these that private estates, agricultural holdings, towns and villages often became established. 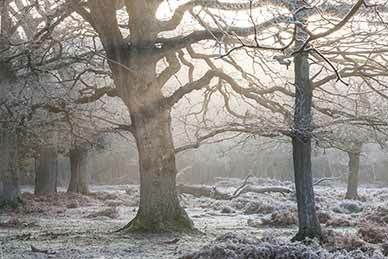 Today, the New Forest encompasses an area of 377 square kilometres (145 square miles), and comprises a substantial part of the New Forest National Park. The Crown continues to own 266 square kilometres (103 square miles) - 71% of the area - which is managed by the Forestry Commission. The remaining 111 square kilometres (42 square miles), primarily around the towns and villages, are in private hands. Areas of modestly high ground – up to 128 metres (420 feet) above sea level - are found in the north and west of the area, creating scenery not too dissimilar to that of Exmoor. In the south and east, gently undulating land dips gradually down towards the sea. And mile-upon-mile of clean, clear, gravel-bottomed streams meander through, whilst quite large expanses of standing water can be found at Eyeworth Pond, Sowley Pond and Hatchet Pond, with many smaller permanent and temporary pools elsewhere. All these places are relatively unspoilt, and all are important in their own right. But put together, they create a wonderful interlocking mosaic of unparalleled diversity, which provides a tremendous range of wildlife habitats. Three of these habitats, however, are worth particular mention - the ancient, unenclosed woodlands; the heathlands and the valley mires. Why? Because nowhere else in lowland western Europe do they now occur on such a large scale. That is a measure of the importance of the New Forest landscape and its wildlife habitats.